Sabarmathi Social Seva Sangam, established in Tirupur district of Tamil Nadu, primarily focuses on providing day care and nutrition to around 300 children in the age group of two to five years. These children belong to economically backward families where the parents or guardians work as daily wage earners. The organisation, in addition to its primary objective, also undertakes other programmes such as arranging monthly free medical camps for the elderly, development camps for women and farmers, health camps and awareness camps, vocational training and family counselling in and around Tirupur. Sabarmathi Social Seva Sangam was awarded a cash price of Rs5,000 for ‘Best NGO’ by Central Social Welfare Board (CSW). 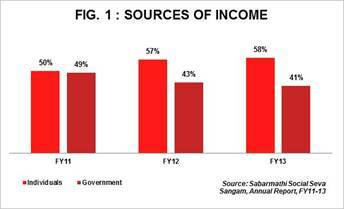 Posted an income of Rs0.1mn in FY13, with 58% of the funds contributed through individuals followed by Government 41%. The NGO receives support from Tamil Nadu Social Welfare Board (TNSWB) and Central Social Welfare Board (CSW), New Delhi for its Creche programme. 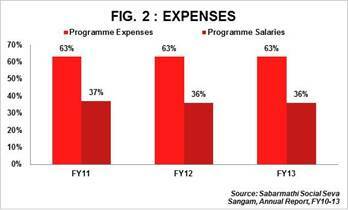 Expenses totalled to Rs0.1mn in FY13 with Programme expenses accounting for 99% of total expenses, thereby indicating effective utilisation of funds. Cash and bank balance comprise of 88% of the total assets. The NGO does not have a corpus fund. The funds utilisation ratio (ratio measures the ability of the NGO to use available funds for its mission) of 92% indicates effective utilisation of funds. The NGO has a self-sufficiency ratio (ratio measures how much of expenses can be met from own income – individual donations/corpus income/fee income) of 58% as the major chunk of the donation is through individuals. Loans taken comprise of 99% of total liabilities (Rs0.1mn) in FY13. This indicates lack of ability to raise funds through general donations.